Remove stains and spills as promptly as possible. this is best achieved with Carpet Max’s FREE Professional Strength Spot Remover. Remove as much excess as possible, then apply and blot with a clean white cloth. DO NOT rub the spot as this might set the stain or damage the carpet fiber. For maximum carpet life, have your carpets cleaned and protected every 9-18 months, or more often if you have children or pets. These common problems are preventable, but often irreversible once they have occured. Learn how to avoid permanent damage and discoloration of your carpet. There is not a lot that a carpet care expert can do with traffic lane gray. When a 10-year old carpet is cleaned, you will end up with a clean 10-year old carpet. Even with the dirt gone, it may not appear the way you had hoped. The easiest way to slow down this process is by rearranging the furniture so traffic areas are changed or to add area rugs or runners. Soil Filtration Lines: (dark lines that often appear around the wall edges and in doorways). It is difficult to predict how filtration lines will respond to cleaning, for they are a combination of excess soil and discoloration due to various gases passing through walls and over the carpet. The soil will be removed, but in some cases the chemical discoloration of your carpets may still be quite noticeable. To avoid this often permanent discoloration, be sure to vacuum the edges of your rooms just as thoroughly as the rest of the room. 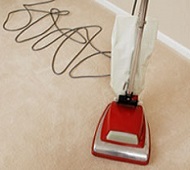 Pay close attention to the areas around furniture legs and make sure to vacuum under and behind doors.